The AC15 is a worthy addition to the Vox Custom range. Plenty of tonal range available from the two channels; a decent tremolo effect. Price arguably only reason to buy this over the AC30; shame the two channels can't be footswitched. In 1962, a young, upwardly mobile pop group called The Beatles became proud owners of a set of Vox amplifiers, thanks to a canny endorsement deal struck by their manager, Brian Epstein. In the years that followed, The Beatles took over the world and, together with other high-profile users such as The Shadows' Hank Marvin, their success helped Vox become established worldwide as the sound of British pop in the swinging 60s. 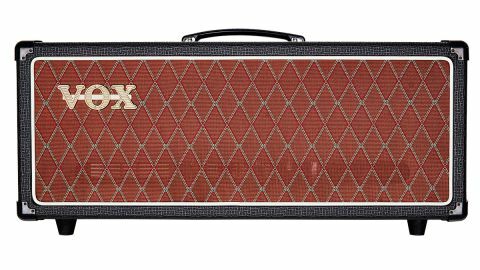 For 2016, Vox has widened its high-end Custom range to include two new heads - the AC15 and AC30 Custom - that feature Vox's new Reactive Attenuator. Today we're looking at the AC15. The AC15 Custom head is fabricated in China, but all the R&D work takes place here in the UK at Vox's UK headquarters. Vox was among the first to shift its manufacturing base overseas and, as you would expect from Korg, the quality control is first class. Inside the cabinet, we see a robust steel chassis and two main printed circuit boards. The top one is oriented vertically and holds all the controls, while the lower one sits horizontally and holds all the valve bases. Access to the valves is easier than some older Voxes: a wooden panel on the underside fastened by woodscrews is all that needs to be removed to get to the 12AX7s and EL84s. The wiring is neat, the soldering is clean and bright, and both amps look ready to take on the world. The AC15 head is slightly shorter than the AC30, with fewer controls and input sockets. There's a pair of jacks for the normal and top boost channels; volume for the normal channel; volume, treble and bass, a reverb level control, tremolo speed and depth, and master controls for volume; and the classic Vox Tone Cut, which acts as a global tone control and works in the opposite way to what you might expect. The rear panel features a pair of speaker outlets, a footswitch jack and a chickenhead knob operating a rotary switch that controls the Vox Reactive Attenuator circuit. This reduces the output power in three steps: from 15 watts to seven to one fifth of a watt. Overall, the amp is well built and looks the part, especially when sat on top of Vox's matching 2x12 enclosure. When discussing the 'Vox sound', we often hear the words 'chime' and 'jangle', which may give the impression that AC models are thin and trebly, when in fact both heads have a distinct midrange emphasis. That chime and jangle is still there and comes into its own for mildly distorted stuff on the top boost channel, but it's the smooth, warm mids that are as much a part of the Vox character as its complex high frequency response. This is accentuated by the Celestion-loaded V212C open-back cabinet, which is perfect for delivering the articulate pop-rock chord and solo stuff that both Vox heads really excel at producing. Crank up the amp, and you're in a thick soup of harmonic-laden overdrive that's as relevant to today's indie bands as it was to the British Invasion back in the mid-60s. It's a particularly vocal overdrive with just a hint of fuzz that sounds equally toothsome with single coils or humbuckers, and fully maxed out you can get that boxy midrange grind that typifies Queen's wall of sound. Power-wise, the AC15 head combined with its matching 2x12 enclosure is plenty loud enough for most pub gigs, although there's not quite enough clean headroom for stuff that demands it, like country picking or funk. Getting a half-decent cranked up sound at home or in the studio would be more difficult as both amps are very loud, but thanks to the new Reactive Attenuator, it's wonderfully simple: just flip the rear panel switch to its lowest setting and enjoy the fully-cranked effect at conversation levels. Intended for serious Vox enthusiasts at all levels, this Custom head is relatively affordable and just as relevant today as the originals were 50 years ago.